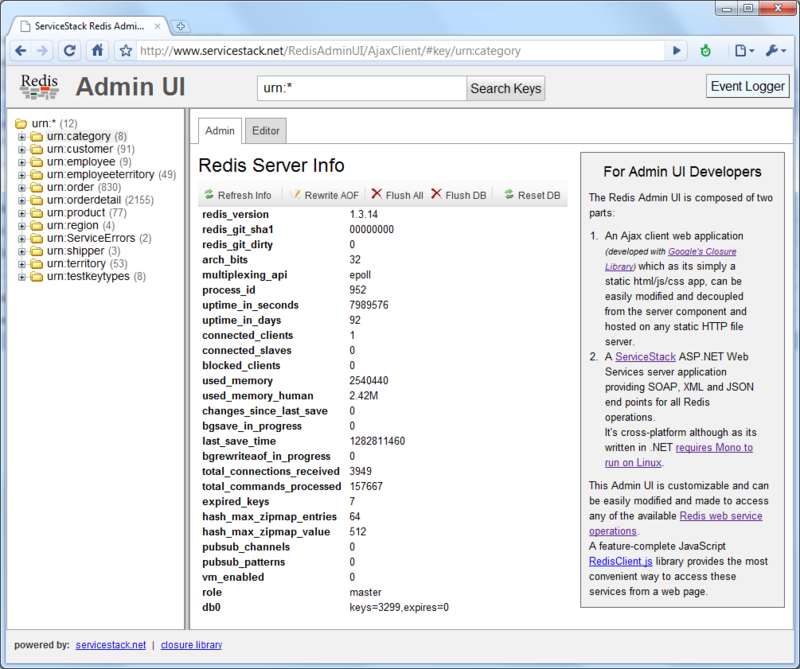 Redis Vue is a simple, lightweight, versatile Redis Admin UI developed using Vue and ServiceStack .NET Core Web Apps. It supports Redis's core Strings, Lists, Sets, Sorted Sets and Hash data structures and custom Redis commands with its entire functionality contained in a single /app/index.html using the dynamic ServiceStack Templates language, making it easy to customize and further enhance. 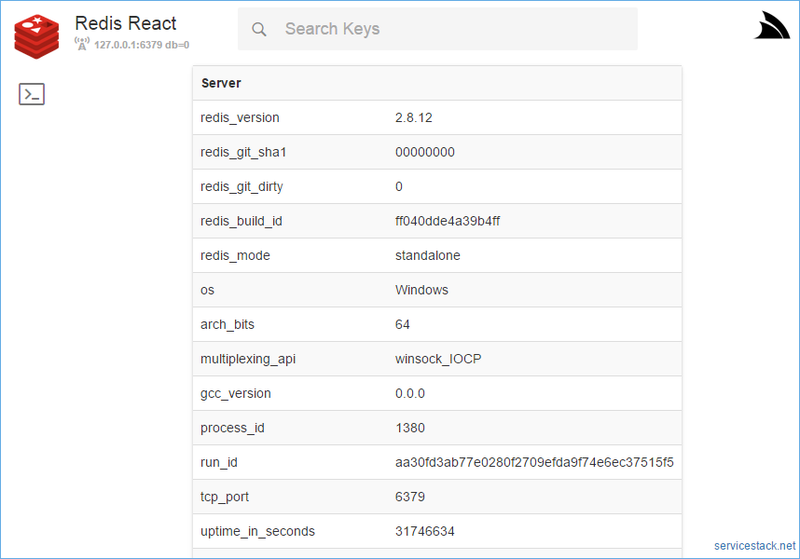 Redis React is a simple user-friendly UI for browsing data in Redis servers that leverages the navigation and deep-linking benefits of a Web-based UI, the productivity and responsiveness of the React framework and the deep Integration possible from a Native App. The Redis React App has been packaged for multiple platforms inc. the ASP.NET Live Demo redisreact.servicestack.net deployed on AWS which you can use to preview Redis React browsing a redis server populated with the Northwind Dataset persisted as JSON following the Complex Type Conventions built into the C# ServiceStack.Redis Client. Confident that I’ve optimized ServiceStack’s JSON web services performance enough with the adoption of my latest efforts developing .NET’s fastest JSON Serializer, I’m now turning my attention towards creating apps that take advantage of it. I’m a firm believer that performance is one of, if not the most important feature in developing an App that most users will love and use on a regular basis. It’s the common trait amongst all the apps and websites I regularly use and is why I’m continually seeking software components and/or techniques that can help make my software run faster; or whenever there is no alternative to develop them myself. Although having said this I’m not a complete perf maniac and find that its important to strike a balance between productivity, utility and performance – which is what has effectively kept me tied to C# language for all my server development. is an advanced key-value store. It is similar to memcached but the dataset is not volatile, and values can be strings, exactly like in memcached, but also lists, sets, and ordered sets. All this data types can be manipulated with atomic operations to push/pop elements, add/remove elements, perform server side union, intersection, difference between sets, and so forth. I found this fascinating since it provides an extremely fast data-store (that gets routinely persisted) supporting rich data-structures that can be safely accessed by multiple app servers concurrently since all operations are atomic. Sweet just what I always wanted – although to make it productive I developed a C# Redis Client that apart from supporting Redis’s entire feature-set also provides a high-level typed API that can persist any .NET POCO Type which gets persisted as JSON in Redis. One of the disadvantages that comes with making use of a shiny new tech is that there is sometimes not a lot of tooling available for it. Despite its vibrant community this is also true for Redis where although it sports a rich command-line interface (Unix software is good like this) the GUI admin tools are somewhat lacking. Not to worry, I actually needed a project to work on to learn about Google’s closure-library anyway so this ended up being a pretty good fit. In order to be able to access Redis from a web page some JSON web services are in order. I could’ve just implemented the services required by the Admin UI although I wanted to flex some ServiceStack muscle so decided to create web services for all of Redis’s operations which on final count totalled near 100 web services that I ended up knocking out over a single weekend. 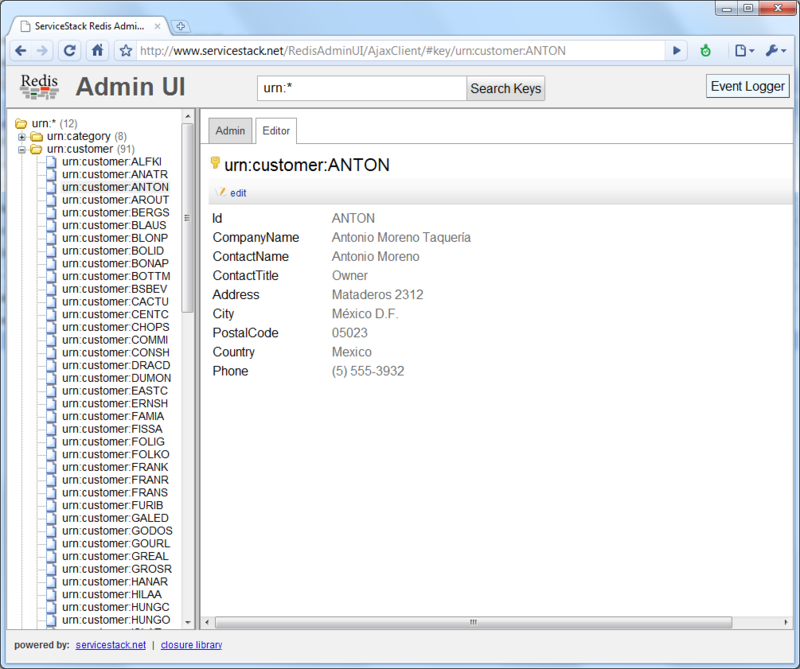 One of the benefits of using ServiceStack to develop your web services is that you get SOAP, XML, JSON and JSV endpoints for free. So after spending the next couple of days creating unit tests to provide 100% coverage, the back-end was complete – thus giving Redis CouchDB-like powers by allowing it to be accessed from any HTTP client. In order to provide a useful Generic UI I’ve had to make a few assumptions on conventions used. Coincidentally these also happen to be the same conventions that the ServiceStack’s C# Redis Client uses when storing data :-) . There are likely to be others I’ve subconsciously used so I’ll make an effort to keep this list of assumptions live. 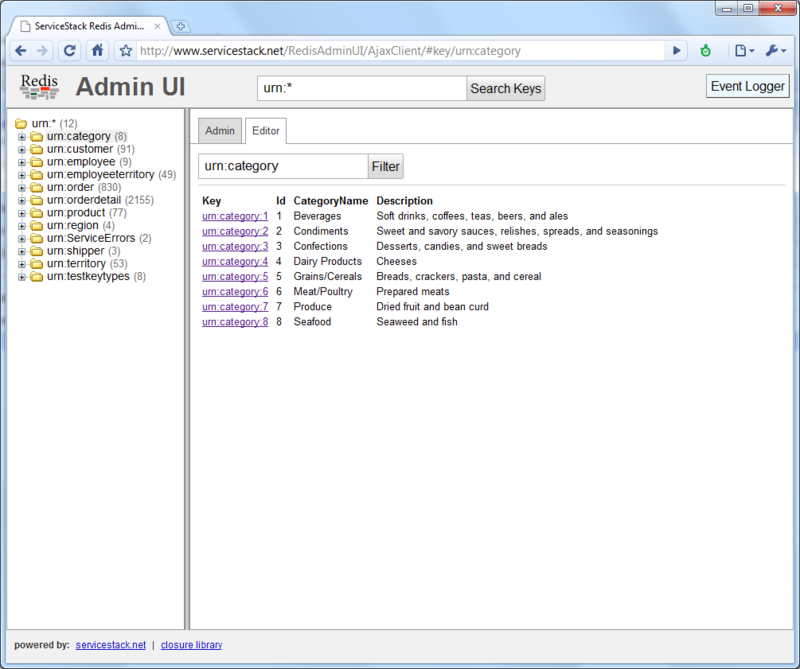 Like the rest of ServiceStack the Redis Admin UI is Open source released under the liberal new BSD licence. In keeping with tradition with most of my software, the Redis Admin UI works cross-platform on Windows with .NET and Linux and OSX using Mono (Live demo is hosted on CentOS/Nginx). I’ve had an attempt at some basic installation instructions that are included in the downloaded and viewable online.